This is what Misfits guitarist Doyle Wolfgang von Frankenstein said to me back in November when we discussed the current reunion of “The Original Misfits.” In 2016, Doyle joined up with bassist (and brother) Jerry Only and singer Glenn Danzig to perform two shows together for the first time since 1983. These performances (at the Denver and Chicago Riot Fests) led to more offers for shows in 2017, resulting in a gig at the MGM Grand Garden Arena in Las Vegas on December 28 and a sold-out spot at the Forum in Inglewood, CA on December 30. (The Vegas booking came about after the Forum show sold out in minutes.) The band’s lineup for all four reunion performances was augmented by legendary drummer Dave Lombardo (Slayer/Grip Inc./Fantômas/Dead Cross/Bladerunner) and second guitarist Acey Slade (Joan Jett and the Blackhearts/Dope/Murderdolls). To clarify, the “Original Misfits” moniker refers to Only and Danzig; Doyle (the group’s third official guitarist) wasn’t a member of the band until 1980. The four shows performed so far under this name have been especially meaningful in that the singer and bassist – two guys from Lodi, NJ who spent six years making music together before spending the decades that followed in and out of courtrooms while often trading barbs in the press - actually stood on stage together. Only and Doyle first reformed The Misfits in the mid-’90s without Danzig, releasing two Metal-tinged albums featuring singer Michale Graves and drummer Dr. Chud. Doyle left the band (which by then featured returning ’82-’83-era drummer Robo and his fellow former Black Flag member Dez Cadena on second guitar) in 2001, later reuniting with Danzig for occasional special live appearances for well over a decade. From 2001 to 2016, Only led an ever-fluctuating lineup of the band that most recently featured his son, Jerry Jr. (a.k.a. “Jerry Other”), on guitar. Thanks to the Riot Fest shows, what many fans (or “fiends”) consider to be the definitive Misfits frontline of Danzig, Only and Doyle was finally back in horror business. One of the most accomplished and celebrated drummers in the world, Lombardo added a bounce and groove to the songs that elevated the band’s overall musicality to new levels. He took the best qualities of each of the group’s various former timekeepers and actually built on them, adding jaw-dropping fills and maneuvers along the way. He is an absolute king behind a kit, and he fit The Misfits like a glove. Of course, this was still a Misfits show, so complete perfection should never have been anticipated. Feedback was pretty much the sixth member of the band, while every song was followed by a lengthy pause. (Also, “All Hell Breaks Loose” started slipping off the tracks when Danzig flubbed the placement of a verse, leading the tune to limp to the finish line shortly thereafter.) The Danzig-led version of The Misfits was and still is a band driven by power, not finesse. The Original Misfits’ set list brought a level of intensity not offered by other band lineups, but the constant between-song drops in energy were sobering reminders of just how tight and explosive the one-song-after-another charge of the Michale Graves-fronted incarnation truly was in its prime. Full marks must be given to Danzig for rising above an apparent respiratory illness to give the crowd the best show possible. While his speaking voice was a hoarse whisper, his singing range was surprisingly strong. (“Some Kinda Hate” and “Hollywood Babylon” were astonishing highlights.) For an unwell man in his sixties, Danzig delivered at the Forum in awe-inspiring ways. Considering The Misfits’ penchant for creating memorable visuals to accompany their music, it came as little surprise that they took to the spacious environment of the Forum like kids in a massive candy store. A row of Crimson Ghost projections near the top of the Forum greeted fiends outside, while the sizable stage boasted gigantic models of the evil pumpkin that adorned the cover of the 1981 “Halloween” single and a huge screen that displayed many of the band’s iconic images. Much has been made of the band’s decision to ban cell phones and other electronic devices at the show. While it understandably created a logistical headache for some, it was fantastic to go to a gig and not have to peer over a sea of screens to see the acts on stage. When it came time for the encore, lighters – not Samsungs – illuminated the venue. The absence of cell phones was a great thing to experience and something that will hopefully become the standard at live music events of this size moving forward. Of course, a few people were still successful in sneaking them in, resulting in a flood of YouTube videos that have already been removed due to copyright claims. Considering that The Misfits’ “fiend” base is equally comprised of grizzled old schoolers who own the original singles and the Hot Topic contingent that buys up the band’s ever-expanding merch line, it was a stroke of sheer genius to book Discharge and Alkaline Trio to open the festivities. Like The Misfits, Discharge began all the way back in 1977, while Alkaline Trio represents the Pop-infused sounds of modern-day commercial Punk. Any misgivings that some of the old guard might have had over seeing Discharge hit an arena stage were dashed fairly quickly once it became apparent that they would be performing for about five percent of the potential audience. With the vast majority of concertgoers still hitting the merch and concession stands during their set, Discharge might as well have been playing a club. (They played for more people two years ago at the 476-seat Brighton Music Hall in Allston, MA than they did at the Forum.) Fortunately (and not unsurprisingly), the sparse crowd didn’t prevent Discharge from maintaining their Punk street cred and showcasing a blistering set of early ’80s classics (highlighted by ferocious versions of “Protest And Survive” and “Hear Nothing See Nothing Say Nothing”) and newer material. (The live rendition of “Hatebomb” from 2016’s bulletproof End Of Days was a prime example of just how powerful these underground vets still are in the present tense.) It was also a pleasure to see current Discharge singer Jeff “JJ” Janiak, formerly of the New Jersey Oi! band Dead Heros (misspelling courtesy of the fellas), effortlessly make the stage his own. Janiak was also responsible for one of the brightest moments of the entire evening when he told the audience that they were witnessing the first Punk bill ever held at the Forum. Playing in front of a gigantic logo backdrop, Alkaline Trio had the unenviable task of being the band that played right before The Misfits. While they are certainly fine players who know how to work a stage, the band’s sonic output was generic at best. Alkaline Trio might provide a great soundtrack for today’s rebellious youth to play on their way to the mall after school, but their pristine, radio-friendly repertoire felt out of place sandwiched between the incendiary groups that bookended the night. The Misfits’ internal squabbles are the stuff of legend, but their music will always be the most interesting thing about them. 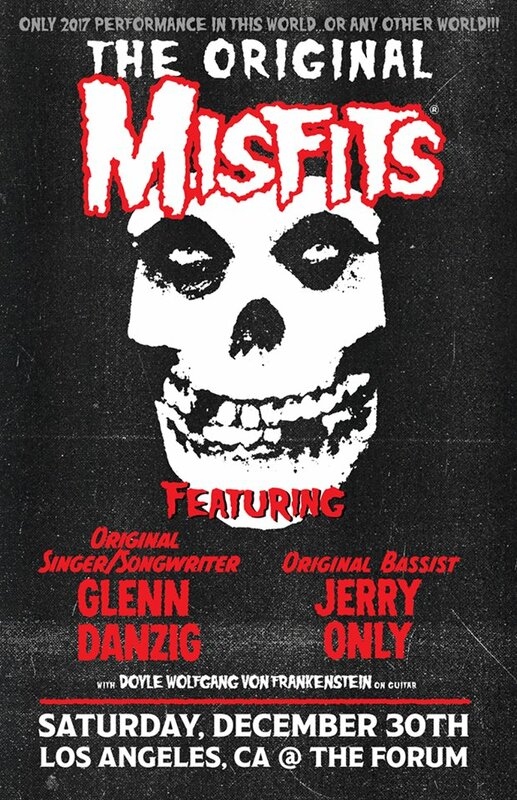 While it remains to be seen if this notoriously combustible combination of personalities will keep it together long enough to carry on through 2018 (or beyond), The Misfits’ time on the Forum stage was an unforgettable celebration of one of the most powerful bands in underground music history. I’m glad these guys did this while they were all still alive to bask in the well-deserved glory. Hostage to History: Dave Lombardo Remembers Grip Inc.